Controversial cleric Yusuf al-Qaradawi has left Kuwait after being asked to leave due to the divisive remarks he has made inciting violence and bloodshed. Qaradawi, who has often voiced support for suicide bombings, was in Kuwait to attend the fourth annual meeting of the International Islamic Charitable Organization (IICO), the Islam Times reported. Kuwaiti MP Abdullah al-Tamimi criticized IICO Chairman Abdullah Al-Maatouqand and called for the expulsion of several of the people invited to the meeting, including Qaradawi, for what he called their lack of neutrality on Islam. “Qaradawi attacked Persian Gulf leaders and accused them of having financed the killing of Egyptians,” he noted. Another MP, Riad Adsani, said, “Qaradawi has glorified Saddam Hussein, who occupied Kuwait and was responsible for the death of our faithful martyrs,” suggesting he should therefore not be allowed in Kuwait. Qaradawi has faced much criticism and a political backlash in recent months, especially from Persian Gulf countries, since he openly criticized Saudi Arabia and called for the release of the ousted Muslim Brotherhood Egypt’s President Mohammad Mursi. Qaradawi is a long time member of the board of the International Islamic Charitable Organization (IICO) which has many members and officers tied to the Global Muslim Brotherhood as well as one member designated by the US in connection with Al Qaeda fundraising. The IICO is strongly connected with Hamas fundraising. 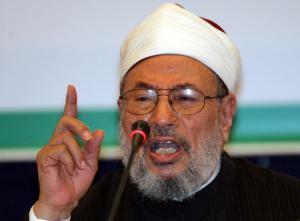 A Turkish news portal is also reporting that Egypt’s chief prosecutor has issued an arrest warrant for Qaradawi who is accused of inciting the killing of Egyptian security forces and meddling in the country’s affairs.